So here’s this week’s thing: every week’s thing, come to that. As I may have mentioned once or twice, I work full time, which leads to a very fragmented writing life. I’m trying to rewrite the beginning of a junior book, and the more I rewrite, the more I delete. I pick apart every sentence the moment it’s on the page. But the main problem is that I don’t know where I’m going. With the book. With writing generally. Maybe I should write and not think. Maybe I should have done NaNoWriMo (when?). Maybe I should give up this thing. Maybe I should have become a lawyer. Maybe I have run out of things to say. And then I find this picture. It’s my great-grandmother, Isabella. Behind her is the house she lived in for nearly forty years. 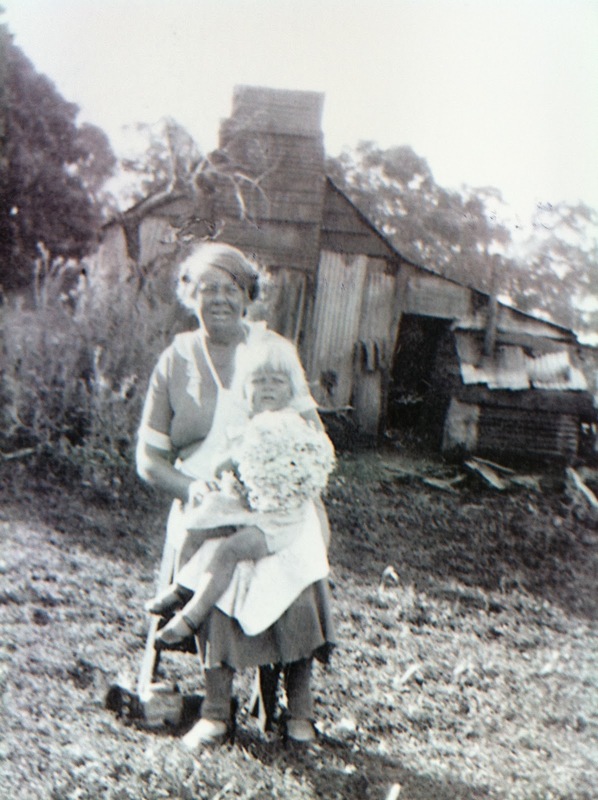 When her daughter Freda (now 95) gave me the picture, she said she couldn’t believe the house was in the photo: it was shameful to be that poor, it still made her cringe to look at it. As a young woman Isabella went to the Boer War, apparently to find her brother, and nursed on the ship on the way home. Then she married a rural widower 28 years her senior, was spurned by her husband’s first family, took in washing to help, walking for miles over the hills near Roelands with baskets filled with other people’s dirty laundry. She died at 65, exhausted. ‘She had a hard life, my mum,’ says Freda. And here I am, worrying about a book I don’t have to write. This entry was posted in Uncategorized on November 7, 2010 by julialawrinsonwriter. wow. that photo is stunning and depicts a life I simply cannot imagine. what a treasure. it does put things in perspective. but still, i feel your angst – and it's still just as valid to feel like that 🙂 thanks so much for sharing. and for what it's worth. I re-read your book Suburban Freak Show this year and absolutely loved it.